Why does Charles Darwin eclipse Alfred Russel Wallace? He jointly came up with the theory of evolution by natural selection, corresponded with the great and good of society, and was given the highest honour possible from a British monarch. His correspondents included David Lloyd George, William Gladstone, Rudyard Kipling, George Bernard Shaw and Arthur Conan Doyle. And on his death 100 years ago, obituaries were effusive in their praise, calling him the last of the great Victorians. You would be forgiven for the name Charles Darwin popping into your head - but you would be wrong. The theory of evolution by natural selection was published jointly between Darwin and Monmouthshire-born Alfred Russel Wallace, whose interest in natural history developed when he moved to Neath and worked as a land surveyor with his brother. But while today Darwin is a household name synonymous with the theory, Wallace struggles to gain anywhere near the recognition of his friend. This is illustrated by an appeal this year to raise funds for a life-sized bronze statue to honour Wallace - it only reached half of its £50,000 target. Wallace expert Dr George Beccaloni, who is a curator at the Natural History Museum where the statue would stand, said: "We have enough money to pay for a torso and arms at the moment. "There are hundreds of Darwin statues and busts but there's not even a bust of Wallace. "There's a side-profile roundel on the wall at Westminster Abbey - not far from Darwin's grave. There's not a lot else." Interestingly, Wallace was not overlooked during his lifetime and was awarded the Order of Merit, the highest honour that could be given by the British monarch to a civilian. His correspondents included some of the most significant politicians in recent British history, and celebrated authors and poets. "He was extremely famous and possibly the most famous scientist and one of the most famous people in the world when he died (in 1913)," said Dr Beccaloni. "There were very long, glowing obituaries in all the world's papers from Bombay to Boston saying he was the last of the great Victorians. "One of the papers said only a great ruler would have had the sort of level of obituary recognition as Wallace." He said Darwin was more famous but died many years before Wallace leaving Wallace to go on and become "the most famous living biologist in Britain". So where did it go wrong for Wallace's reputation? 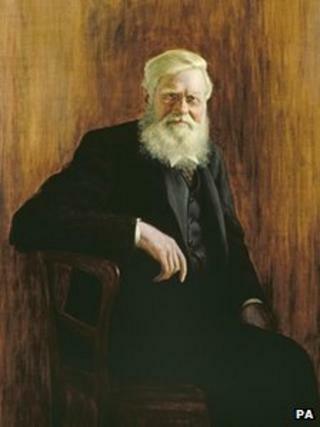 Prof Jim Costa, director of a biological research station in North Carolina, USA, and an expert on both men, says part of the problem appears to be that Wallace failed to promote his role in formulating the theory as effectively as Darwin. While they had jointly published the theory of evolution by natural selection in a paper in August 1858, it was Darwin's On the Origin of Species the very next year that truly grabbed the public's imagination. Even one of Wallace's own books appeared to pass on the credit for the discovery. It was called 'Darwinism: An Exposition of the Theory of Natural Selection with Some of Its Applications'! Prof Costa said another factor was what became known as the "eclipse of Darwinism", when natural selection fell out of favour in the late 19th Century. By the time it was revived in the 1930s, neither man was around and the world was a very different place. "I think when this idea was resurrected in 1930 there was a new generation and they very much had Darwin on their minds," said Prof Costa. "Wallace I think had a role in this - his book 'Darwinism' for example. He tended to downplay his role in public forums and that just didn't serve him well. "When it [natural selection] was resurrected, it was always associated with Darwin." He said when evolutionary biology really took off in the 1940s, the history of the discovery had been largely forgotten. A Darwin "industry" developed and, said Prof Costa, it viewed Darwin as the "great visionary". While little has changed since in terms of public acclaim, there are signs that Wallace's work is gaining more recognition in certain circles. A series of events are being held around the world to commemorate the centenary of Wallace's death this year under the Wallace100 banner. These include an exhibition in Swansea, a lecture in Berlin and a two-day conference in Malaysia. Comedian Bill Bailey recently unveiled a restored portrait of Wallace at the Natural History Museum and has also filmed a two-part documentary for the BBC about Wallace. Thousands of Wallace's letters have been put online for the first time, including correspondence with Darwin about evolution by natural selection. There is even hope for the statue with renewed efforts being made to raise the rest of the money by August. But gaining the same level of acclaim as Darwin is another matter. "I think that in the popular imagination, it would be very, very difficult. It's indelibly Darwin and monkeys," said Prof Costa. "I don't think there's much we can do about that but I do think he will emerge from relative eclipse by Darwin, certainly in the broad academic world and the world of naturalists.